Enjoy your stay in a Contemporary Home in a Country Setting, to VACATION, not for events, 15 minutes from the airport, 15 minutes to Old Town Scottsdale, 15 minutes to down town Phoenix, 45 minutes to the Cardinals Stadium. Great Location. Quiet area, horse property, large homes on 1+ acre lots in neighborhood. This luxury home has been recently renovated and divided into 2 dwellings. The rental unit has 2 bedrooms, bathroom, shower, kitchen and dining area, fully equipped kitchen, living room, washer & dryer. It’s a fully-furnished home that sleeps 4 comfortably. A queen size air mattress is available at your request for 1-2 more guests. There is also a separate 1 bedroom guest cottage on the same property with a bathroom & shower, dining area, fully equipped kitchen, dish washer, living room, washer & dryer. It’s a fully-furnished home that sleeps 2 comfortably. It also has a small gated yard with a dog door. Pet are welcome. 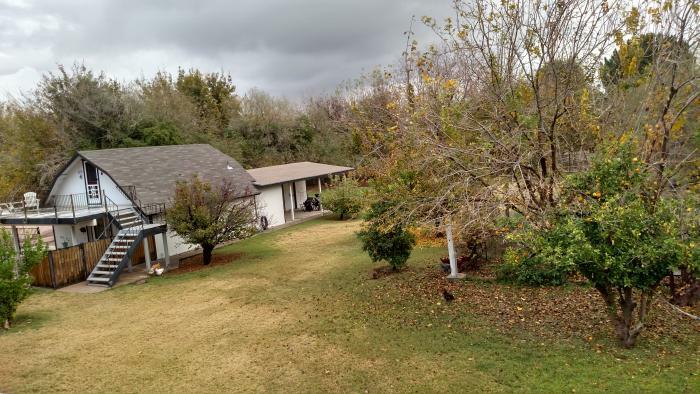 1 acre beautiful backyard has a country view including, trees, fall leaves, chickens and a Zen garden. Large ground level patio with heaters, Outdoor Fireplace, Gas BBQ for grilling, parking spaces, Smart TV, Wi-fi, Cable TV, RO Water, Housekeeping Service Available. Linens & towels included. Nearby Attractions: Golf, Hiking, Biking, Boating, Horseback Riding, Sports, Museums, Ghost Towns, Amusement Parks, Day Trips to Sedona & Grand Canyon. Minimum 6 night stay, 50% deposit due on reservation, balance due on check-in. Deposit is non-refundable. $500 refundable security deposit (will be returned in full if nothing is broken or missing). $100 cleaning fee. Visa, MasterCard accepted. For more info please call or text owner at 480-600-0799. This rental is located in Mesa, Arizona 85201 and has 1 upcoming nearby event.